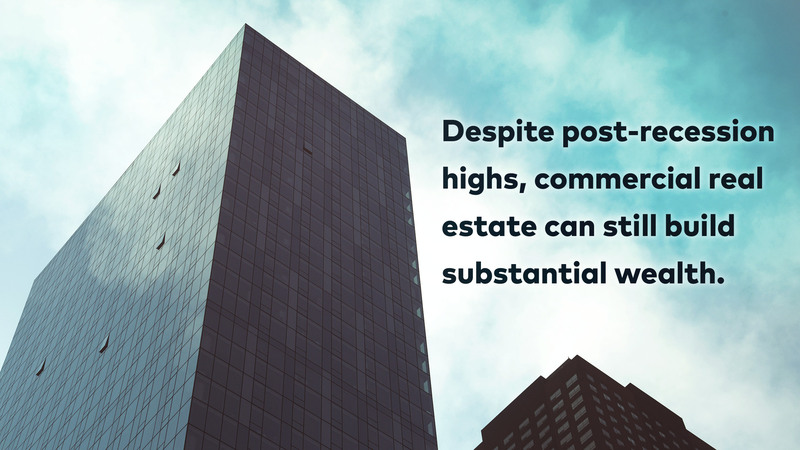 Commercial real estate is an asset class that can build long-term returns and substantial wealth. But the change in administrations, a rise in interest rates since Election Day and post-recession highs for property prices beg the obvious question: is it still a good time to invest in commercial real estate? At Origin Investments, a private equity real estate investment firm, we get this question all the time and understand why. Prices are rising. They passed their 2008 peak more than a year ago, according to market analyst Real Capital Analytics, and have continued to rise in 2016, notes the National Association of Realtors new "Commercial Real Estate Outlook: 2016.Q4." But we believe there is still tremendous value in today's market. Many real estate investors agree with this assessment and are largely optimistic, according to the Urban Land Institute (ULI) 2017 "Emerging Trends in Real Estate" report. One of the reasons is that they expect a kinder, gentler real estate market. "Real estate transaction volume across the country rebounded, but development remains below historical norms for most property types," notes the report. One type of investment property that real estate economists continue to be upbeat about is multifamily, according to a report in National Real Estate Investor (NREI) on ULI's recent fall meeting. And while the top-performing markets tend to be along both Coasts, across the South and include Denver, Salt Lake City and Chicago, "opportunities still exist within most markets"--for those with the acumen to find them, notes ULI. As disciplined investors and asset managers, we are still finding commercial real estate deals that make sense. But most significantly, we believe that commercial real estate investing will continue to be a stable and lucrative way to build wealth now and in the future thanks to market fundamentals. Economic indicators are strong. After a slow start to the year, U.S. gross domestic product picked up in the third quarter. According to the latest estimate from the Bureau of Economic analysis, real GDP advanced 2.9 percent in the third quarter of 2016, a healthy improvement over 1.4 percent gain in the second quarter. Job growth is fueling the fire. Continued job growth in recent years has led to low vacancy rates and rising rents, which has created demand within the commercial real estate market. This will drive demand for office space as well as create a need for more apartments and other multifamily complexes for employees, especially millennials, to live and work. The latest report from the Bureau of Labor Statistics substantiate this assessment; besides overall employment trending upwards, construction jobs also remain strong. Office rents continue to climb. Low vacancy and new office development in the pipeline have had a positive impact on leasing rates across the U.S. According to Jones Lang LaSalle's 2016 Q3 U.S. Office Outlook, office rents have risen by 1.0 percent over the quarter, reaching a cycle high. Growth has been led by secondary markets, such as Denver, one of Origin Investment's eight target markets. Sales look good too. During the first half of 2016, total U.S. commercial real estate sales reached139.4 billion, according to a report from Avison Young. Sales were led by the office sector, which has experienced inconsistent performance among sectors in recent years. Gateway cities like New York and Los Angeles had the highest sales volumes, but it was the secondary markets who saw the most growth. In fact, between 2014 and 2015, office sales volumes in Raleigh/Durham, N.C. and St. Louis, M.O. increased by over 400 percent, notes National Real Estate Investor. Growing markets like these create an opportunity for private equity real estate investors to realize impressive returns. Returns are still attractive. In today's low-interest rate environment, investors looking for yield are moving toward commercial real estate for "its potential to offer more stable, higher-yield returns over the long term," notes CBRE in Forbes. "While commercial real estate also has risks...its fundamentals remain strong." According to recent data, over the past five years, U.S. pension funds have been consistently increasing allocations to real estate, reports NERI. Risk is being rewarded. Real estate isn't the only asset class priced at historic highs. Since the election, the Dow Jones Industrial Average has set six new record closing highs. Clearly high prices don't keep investors out of the stock market. The case for real estate is even stronger than for stocks. Institutional quality real estate yields are still well above historical averages. Even with the recent rise in rates, spreads are 300 or more basis points above ten year treasuries and in line with historical averages. In 2007's peaking real estate market, the spread was only 1 percentage point. Buying commercial real estate today is much more rewarding compared with the low yields on other long-term investments. Multifamily is a stable option. While the outlook for commercial real estate has been positive, there is still the possibility of a recession in the near term, notes NERI. This could pose a threat to sectors like office space, since companies may have to downsize, but multifamily properties will remain stable. People will always need a place to live, which makes multifamily a smart defensive play. Opportunities still exist. Urban residences and the conveniences they offer have been rising in popularity, especially with millennial home dwellers. But instead of hurting the suburban market, this creates an opportunity for housing developments outside of the city that offer high-end amenities typically found in urban settings. So no, it is not too late to invest in commercial real estate. By taking a strategic and disciplined approach, investors in private equity real estate can realize impressive returns in both growing and maturing markets.